Your first question might be, "What does hula have to do with The Aloha Project? On the page of The Healer Plan it is briefly mentioned that dance can be one way of teaching people to harmonize body, mind, and spirit. Hawaiian Hula is one of the best forms of dance in the world for teaching people how to experience that kind of harmony. Although many people still think of hula as a kind of tropical exotic dancing, the real hula of Hawaii, in its kahiko (ancient) and 'auana (modern) forms can be a path of spiritual development as well as a source of joy to beholders and dancers alike. You can take part in this Plan if you start dancing hula, no matter where you are or who you learned it from. Even when you do it alone it has a harmonizing effect on you and your environment. A good source for learning hula is the Halau Hula Na Lei Kupua O Kaua'i, an unconventional hula troupe of Aloha International led by Susan Pa'iniu Floyd and Fern Merle-Jones, both of whom have studied with a number of kumu hula (professional Hawaiian hula teachers), including Kawaikapuokalani Hewett. This troupe has weekly drop-in classes for beginners on the island of Kauai. Email huna@huna.org for more information. 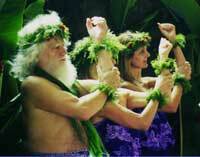 Another option is to look for a hula troupe in your own area that you can join. There are hundreds of hula schools available now throughout the world. Hawaiian hula is also for men, and for those who do not like to dance, nearly every troupe has a need for drummers and musicians. At the very least, you can learn and do the simple movements of Kalana Hula.